Electrode-supported hydrogels were conferred with the biospecificity of enzymes during the process of electropolymerization to give rise to a class of bioactive, stimuli-responsive co-joined interpenetrating networks of inherently conductive polymers and highly hydrated hydrogels. Glucose responsive biotransducers were prepared by potentiostatic electropolymerization [750 mV vs. Ag/AgCl (3 M KCl)] of pyrrole at Poly(hydoxyethyl methacrylate)-based hydrogel-coated Pt micro-electrodes (Φ = 100 μm) from aqueous solutions of pyrrole and glucose oxidase (GOx; 0.4 M pyrrole, 1.0 mg/ml GOx) to 1.0 and 10.0 mC/cm2. Polypyrrole was them over-oxidized by cyclic voltammetry (0–1.2 V vs. Ag/AgCl, 40 cycles in PBKCl, pH = 7.0). Biotransducers were stored at 4 °C in PBKCl for up to 18 days. Amperometric dose–response at 0.4 V vs. Ag/AgCl followed by Lineweaver–Burk analysis produced enzyme kinetic parameters as a function of electropolymerization charge density and storage time. Apparent Michaelis constant (K Mapp) increased from 18.6–152.0 mM (1.0 mC/cm2) and from 2.7–6.1 mM (10.0 mC/cm2). Biotransducer sensitivity increased to 21.2 nA/mM after 18 days and to 12.8 pA/mM after 10 days for the 1.0 and 10.0 mC/cm2 membranes, respectively. Maximum current, I max, also increased over time to 2.7 nA (1.0 mC/cm2) and to 170 pA (10.0 mC/cm2). Electropolymerization of polypyrrole is shown to be an effective means for imparting bioactivity to a hydrogel-coated microelectrode. GOx was shown to be stabilized and to increase activity over time within the electroconductive hydrogel. 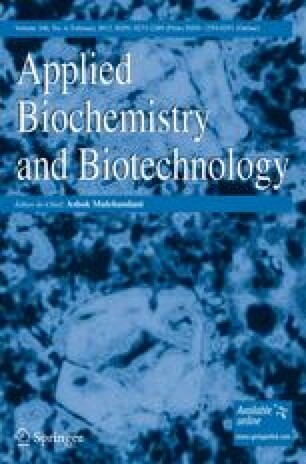 The authors acknowledge support from the US Department of Defense (DoDPRMRP) grant PR023081/DAMD17-03-1-0172 and the Consortium of the Clemson University Center for Bioelectronics, Biosensors and Biochips (C3B). A. M. Wilson acknowledges support from the Department of Chemistry, University of the West Indies, St. Augustine and ABTECH Scientific, Inc.